Every one of our foremen has worked continuously at AAA-1 Masonry & Tuckpointing for 30 years. 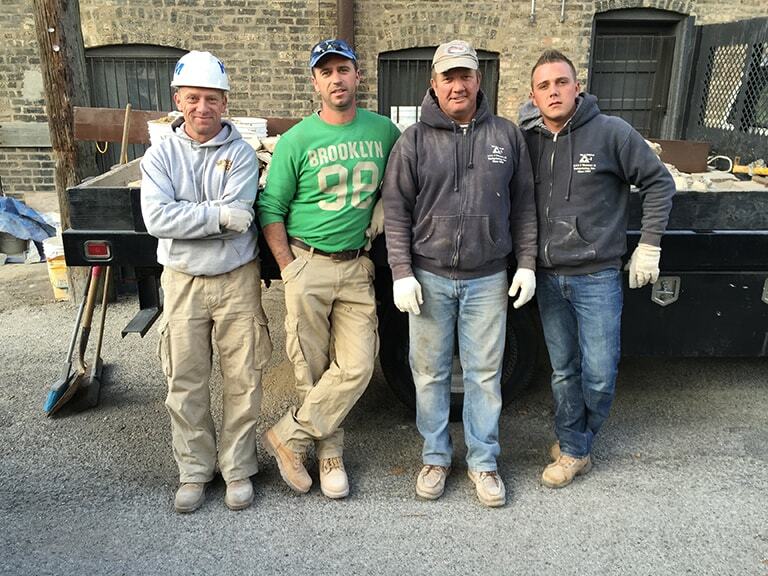 Prior to overseeing our seasoned teams, these men spent years as laborers, tuckpointers and brick layers themselves, so they have the field experience to address your masonry issues with skill, efficiency and safety. 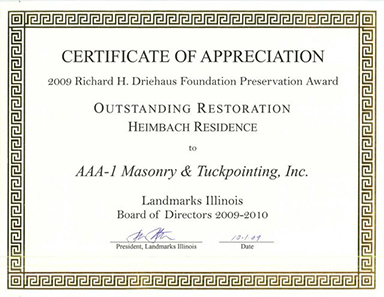 Our mission is to restore and protect your masonry investment and prevent future problems. 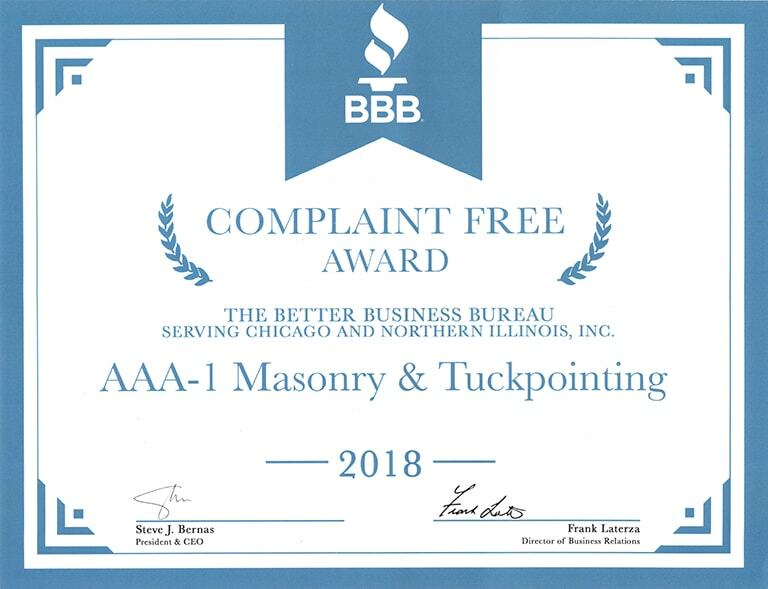 We consider every client to be important; you will receive the professional diagnosis, clearly written scope of work, and professional job execution you would expect from a company in continuous operation since 1954. 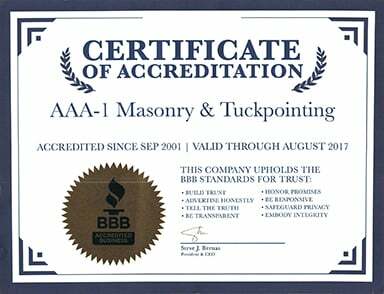 The owner and senior project management at AAA-1 Masonry & Tuckpointing are licensed mason contractors. To become licensed, we passed a rigorous testing program. 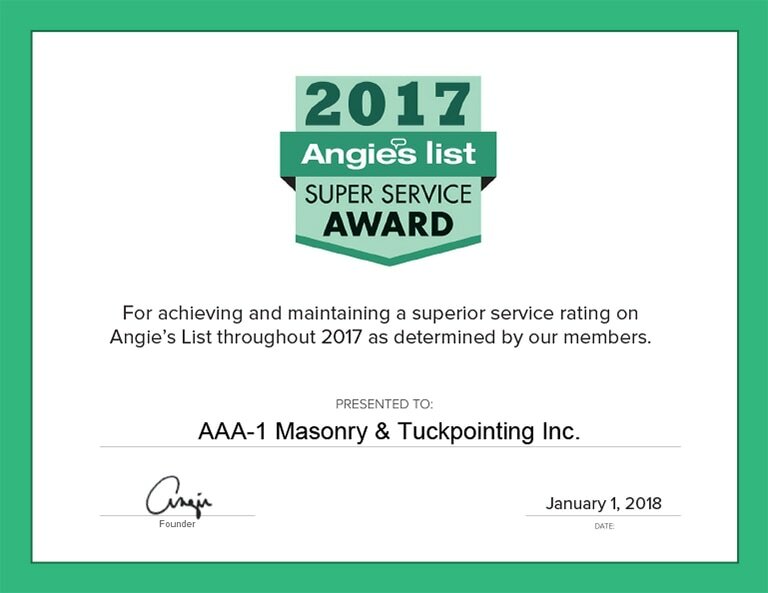 This knowledge combined with decades of in-the-field experience and a commitment to on-going safety training qualifies AAA-1 Masonry & Tuckpointing to provide to you the best in masonry services. 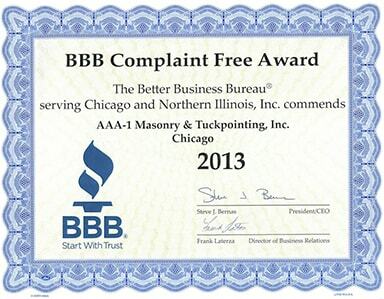 We are completely insured and happy to provide you with a copy of our insurance upon request. 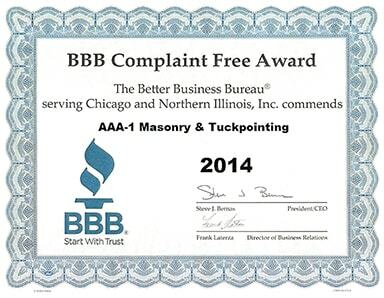 AAA-1 Masonry & Tuckpointing has maintained an A+ rating with the Better Business Bureau since 2001. 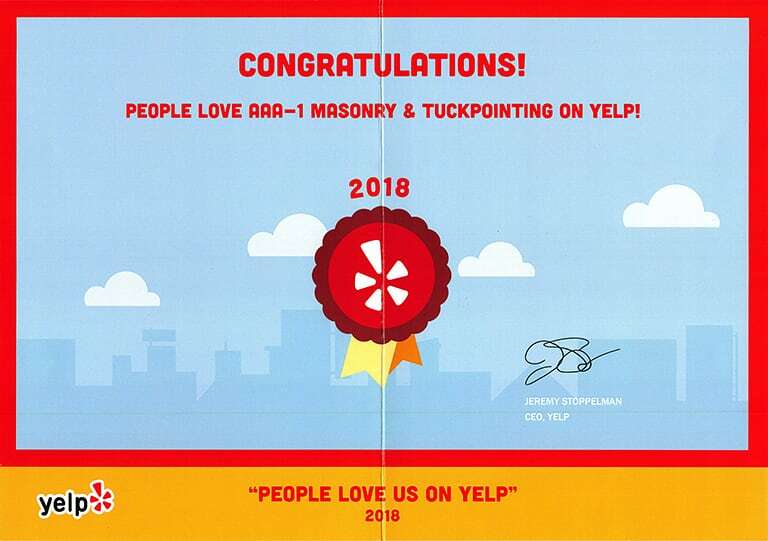 We have garnered numerous awards and citations, including Angie's List Super Service Award (2005, 2006, 2013) given to fewer than 5 percent of vendors, and Yelp's People Love Us Award (2017). 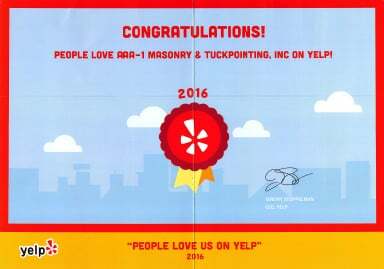 We have garnered and continue to receive positive reviews on numerous social media sites. 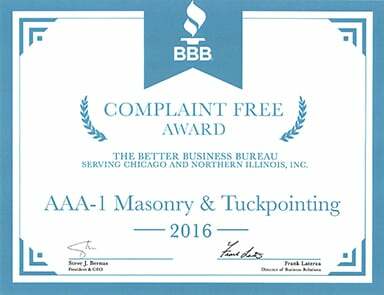 We are members of the Association of Condominium, Townhouse and Homeowners Association (ACTHA) and Community Associations Institute (CAI). 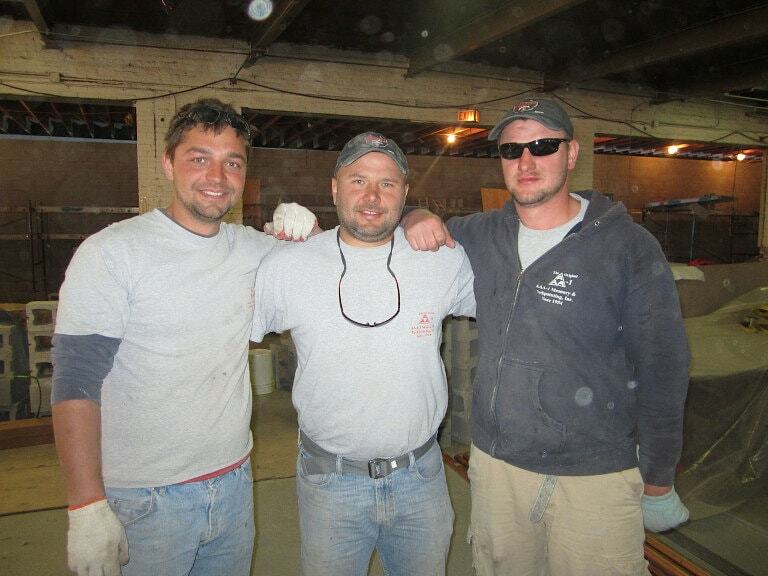 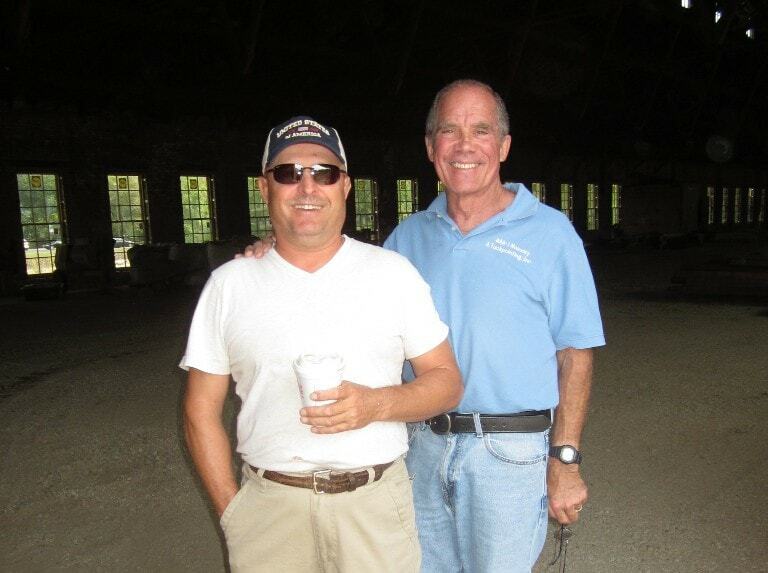 No matter how you find us, we look forward to putting our centuries of combined field experience to work for you. 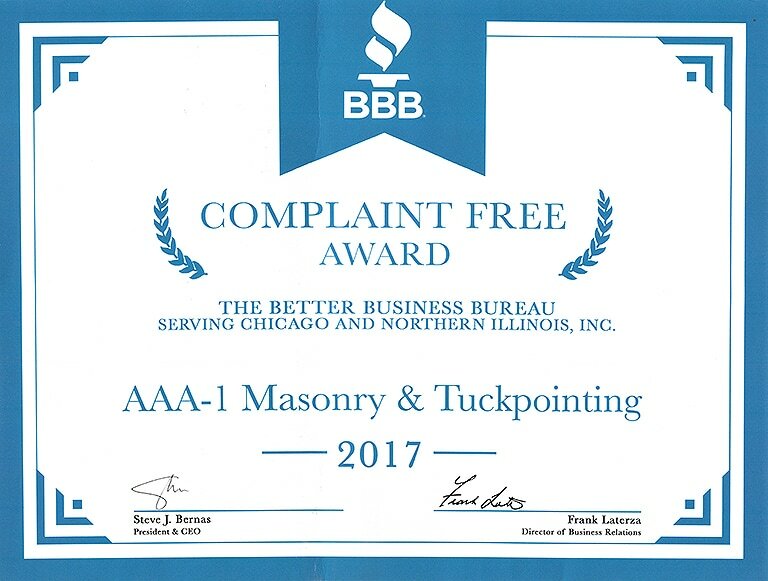 AAA-1 Masonry & Tuckpointing has worked on projects in every neighborhood in Chicago and every town, village and city in the Chicagoland area. 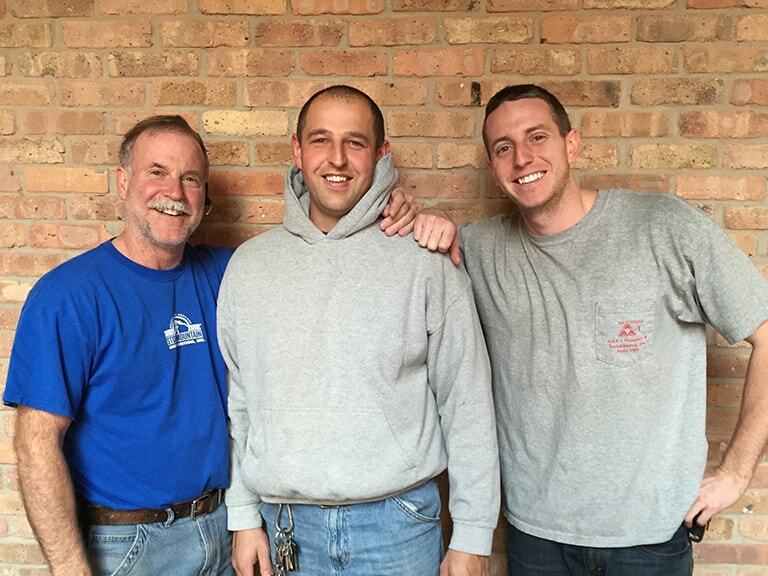 On the North Shore, we work regularly in Deerfield, Des Plaines, Evanston, Glencoe, Glenview, Highland Park, Highwood, Kenilworth, Lake Bluff, Lake Forest, Morton Grove, Niles, Northbrook, Northfield, Park Ridge, Skokie, Wilmette, and Winnetka. 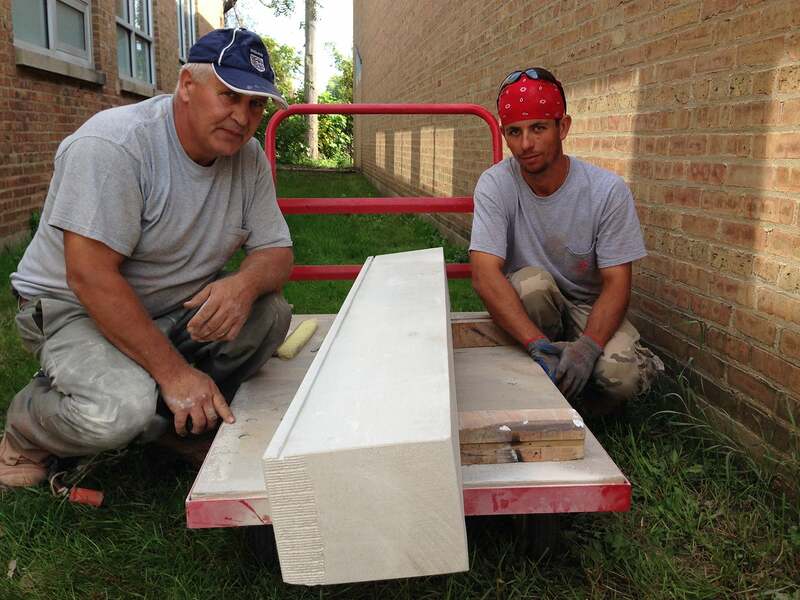 To the west of Chicago we enjoy working in Oak Park, River Forest, Riverside, and LaGrange. 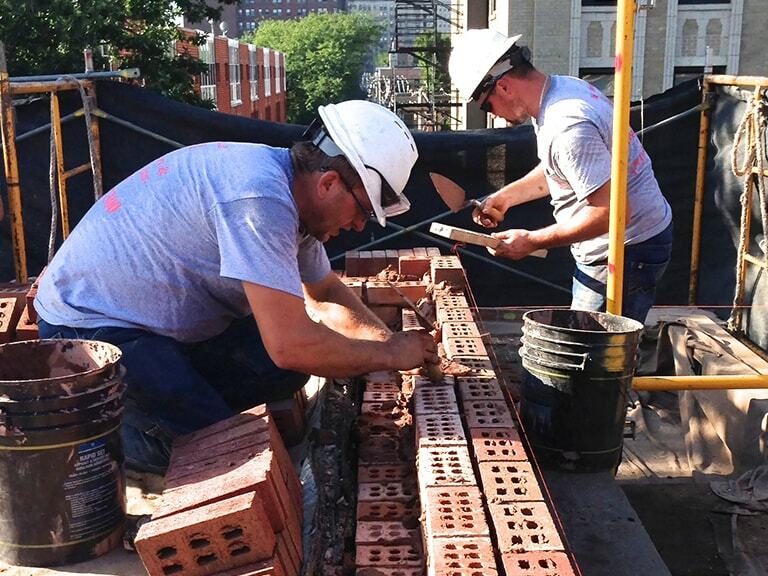 Within Chicago city limits, you'll find us restoring masonry structures on the Near North Side from Streeterville and River East to the Gold Coast; on the North Side in neighborhoods from Lincoln Park and Lake View to Rogers Park, Uptown and Edgewater; on the Northwest Side from Bucktown and Wicker Park all the way up to Old Irving, Albany Park, Mayfair and Jefferson Park; on the West Side in neighborhoods from River West, Tri-Taylor and Ukranian Village to Humboldt Park and Austin; and on the South Side from Printer's Row and the South Loop to Kenwood, Hyde Park and South Shore.